There is evidence that more than a million years ago, herds of millions of wildebeests, or gnu’s, made an annual great migration in the northwest region of Tanzania. They still do the same, and we can be witness of this spectacular miracle! Since father and son Grzimek studied the pattern of the running gnu’s in the fifties, many people have had the stunning experience of watching it. Do you want to see the great migration, but are you wandering when or where to go? African Wildcats Expeditions Ltd is the ultimate safari company with very experienced professional safari guides, guiding clients from all over the world for almost 25 years, for the best great migration tracking in Serengeti National park. We are the key to open the door to the mystery of African wildlife in Tanzania. 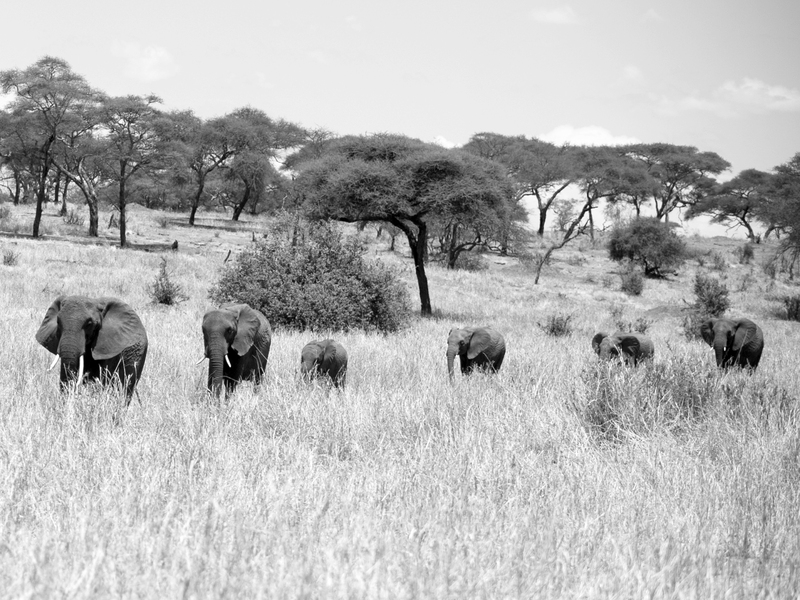 January is the beginning of the time of abundance on the endless plains in the south-east of the Serengeti. The herds arrive here around new-year from the North. This month the big herds of wildebeests, zebra’s and gazelles, swarm over the short-grass-plains Ang’ata Kiti and Ang’ata Sale in the Ngorongoro Conservation Area. Thanks to the short rains of December fresh grass is growing again. The zebra’s have followed the wildebeests on a big part of their great migration. They give birth in this area, most of the zebra-fowls are born in December and January, after a gestation period of 12 months. February is the month for wildebeest births, it is the Calving Season. The grass on the fertile volcano-soil ( “black-cotton-soil”) of the southern plains of the Serengeti has a high amount of phosphate and is the best grass for milk-production. The mothers want to be here now, to produce rich milk for their calves, who have to stay-up with the herd very soon after birth. Predators follow close by, but they can be seen from a long distance in the short grass. Because in the Calving Season of about 3 weeks, each day 8000 calves are born, many will survive. Now the great migration moves towards the Ndutu Woodlands because there is plenty of water in Lake Masek and Lake Ndutu. The long and heavy rains start in March with dark clouds appearing from the south. The wildebeests roam about the plains, mainly in western direction. The short-grass plains of the Ndutu area in the south of the Serengeti-ecosystem now host some 1.3 million wildebeest, 800,000 zebras and many gazelles. April is one of the most consisting months to see the herds. Migration will be around Lake Ndutu woodland and spread out towards the hidden valleys around Kusini- Moru- and Simba-kopjes. These are the best places to see many lions on the rocks, waiting for wildebeests to pass by on their way to Seronera valley at the center of the park. The kopjes give good hunting opportunities, and have healthy big cat populations. Most of the rain falls in the evening. And when it rains during the day, it’s a spectacular view, from your Land-cruiser. Our professional drivers are specialized in off road driving and used to the slippery soil. If you plan a trip from February to April you’ll be rewarded! In May there is still enough grass, but water is becoming scarce. The plains are becoming dryer and the grass cannot keep up with the heavy grazing any-more. The animals form columns of hundreds of thousands wildebeests, over many kilometers, heading to the woodlands in the Seronera valley. Most of them move towards the Western Corridor while some herds go straight to the Lobo Area in the North. In August, these groups will meet at the Mara river. Thanks to the good grass of the past few months and the rich milk, the calves can follow the herds, running through the grasslands, savannas, woodlands and rivers. May-June is mating-time, so the bulk of births will take place in February, after a gestation period of 8 months. In June, rains come to an end and the herds leave the black-cotton-soil plains, heading West through the Western Corridor, in the direction of Lake Victoria. At the end of the month the wildebeests start to cross the Grumeti, Mbalageti and Kirawira rivers, in spite of the risk of drowning and being swallowed by the crocodiles. These big beasts celebrate big feasts here every year, when over a million wildebeests go north, driven by ancient instincts. Gnu’s can detect rain over a very long distance. Zebra’s take advantage of this skills of the gnu’s, and follow them on their great migration. In July, after these river-crossings, the survivors pass eastbound through the Grumeti Game Controlled Area north of the Serengeti. But also a substantial portion of the herds is heading towards the Lobo area in the west of Serengeti Park. This time of the year we see many big cats like lion, leopard and cheetah in Serengeti National Park. That’s why July is called Cat Season. In August the river-crossings of the Mara River between Serengeti and Kenya’s Masai Mara can be seen. The wildebeests sacrifice many lifes to reach the Masai Mara in Kenya, the most northern part of the ecosystem. This part is wet, but too small, and the grass is not rich enough. But it is a very welcome and necessary escape for the dry season. Zebra’s follow the wildebeests to the Masai Mara, gazelle’s and other herbivores will go back to the center of the park where they can get water from rivers. The wildebeests and zebra’s enter the Masai Mara at the west-side, and migrate grazing to the east-side. During October they bend to the South. In September the great migration can be followed the best in the Masai Mara. However, in the Serengeti life goes on and there is a lot to see! Especially Grant and Thomson gazelles are coming back to the woodlands were is plenty of water and grass for them. (for the gnu’s there is not enough). The big cats are easily spot now the grass is short and dry and they concentrate around the remaining water pools. This is even more easy in October, the driest month in the Serengeti. This is the best time to see a lot of big cats and many herbivores and other animals. The grass is not providing good hiding-places. The bulk of the wildebeests and zebras is briefly in the Masai Mara Game Reserve. But this area is too small for the big amount of animals, the grass cannot stay nutritious enough. 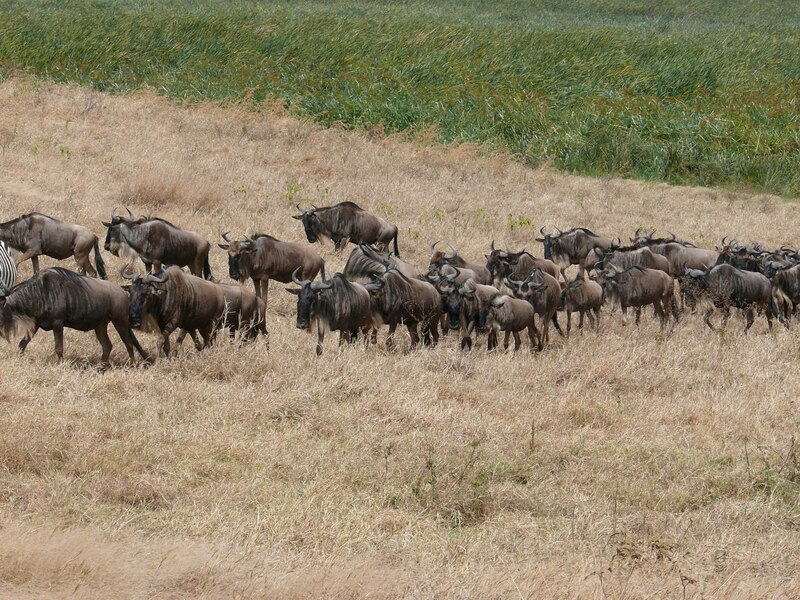 So the wildebeests have to move on to find fresh, nutritious grass again. They already are heading south now. From mid-November the great herds come back from Masai Mara Game Reserve to Serengeti National Park. They spread out over the Loliondo Game Area east of the Serengeti, and over the eastern part of the Park, towards the south-eastern plains again. December is the month of the short rains. 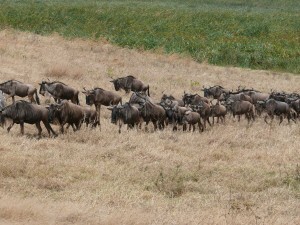 The gnus are approaching the plains in the South-East, where the calves will be born in February. We can find them now on the plains in the western part of the Ngorongoro Conservation Area and around the kopjes and Naabi Hill gate. By the time the great herds have finished this trip, they have covered 30,000 sq-km of the Serengeti ecosystem, and traveled 600 km. Note: Every year the wildebeests choose slightly different routes, depending on the rainfall. The migration can be up to 200 km away from previous routes. Despite the good weather forecasts, we cannot predict the routes exactly, as the gnus “smell” the rain from 50 kilometers. 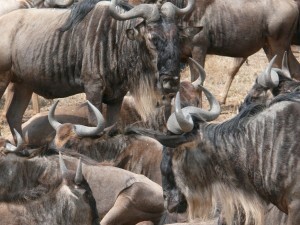 Wildebeests make their own decisions, and keep The Great Migration a magic mystery. 1. December- April: Southern and Eastern part of the Serengeti, Ndutu, Gol-, Moru- and Simba-Kopjes. 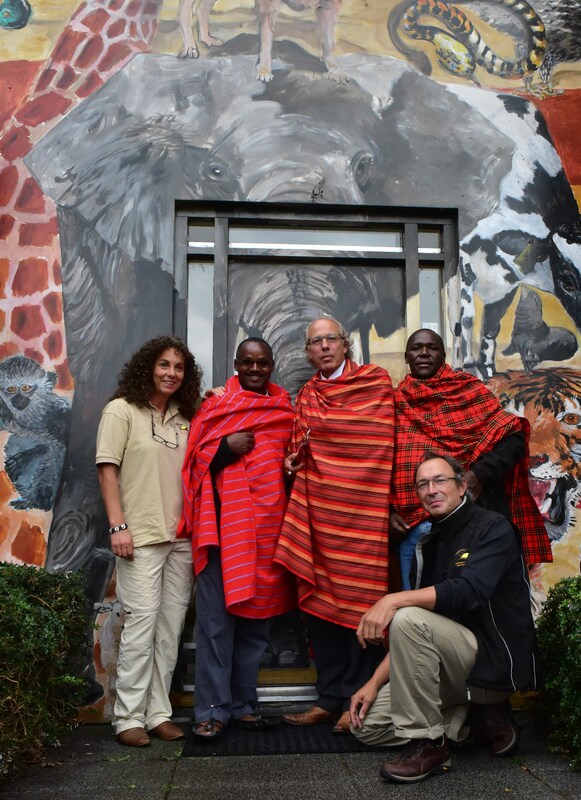 Accommodation: We advise to stay in Ndutu Area (Lodges and Tented Camps). Or stay at Seronera campsite, and explore the largest part of Serengeti National Park as well as Ndutu Area. You can also stay at Simba camp-site on the rim of the Ngorongoro crater and have day trips. 2. May, June, July: Seronera to Western Corridor at Grumetti River. Accommodation: Our choice of accommodation will be in the Western corridor (tented camps) , or at the center (Lodges or camp-sites). 3. August and September: Mara River area.